Design options for wheelchairs seem stuck on a spectrum from boring to next-level boring. That's what Andrew Slorance wants to change. The UK-based entrepreneur is in the process of getting his Carbon Black chairs FDA approved to bring the distinctly stylish chairs to the U.S.
Made with lightweight, streamlined carbon fiber, the Carbon Black wheelchair was designed well: The sporty, minimalist look is so far removed from the metallic, sterile appearance of a traditional wheelchair that it looks like a foreign luxury sports car next to older chair models. It's what I imagine Professor X would use if he had his pick today (although, of course, we've said that before). "It is designed to empower the user in the knowledge they are using a highly designed, high tech piece of kit not a medical device," Slorance told me. 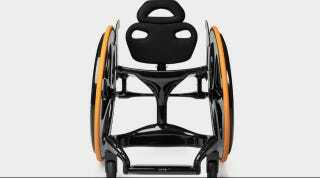 Carbon Black customizes each chair, so you can get a certain type of wheel or make adjustments based on specific needs. In addition to looking good, the thin material makes it an easy chair to push around, and the rounded edges aren't just an aesthetic decision: They are made that way so they won't snag on clothes as well, and to make dismantling the chair to transfer into a car an easier process. Carbon Black is aiming for U.S. retail in 2015, but even after they need FDA approval, they'll need to get insurance companies onboard to make the custom-made chairs affordable, especially since it's a very small family company manufacturing in small batches right now. As a result Carbon Black chairs are about double the price of a standard chair. "We really want to get it VA approved so veterans can get it provided for them and of course insurance companies are in our sights too," Slorance told me. So that'll be a battle for affordability, but one worth fighting. This is a wheelchair created by someone who knows what it is like to be reduced down to your medical equipment, a chair designed to enhance life without entombing users in dated stereotypes. Carbon Black isn't the only lightweight carbon fiber wheelchair idea. Motion Composites, a Quebec-based company, sells attractive, sleek wheelchairs with carbon fiber finishes. While they're not quite as distinctive from a design standpoint, they are already on the market, so there are already other options besides a traditional chair. There's another contender in the pretty wheelchair market for people who want to use a power chair: the elegant Whill is a minimalist motorized mobility tool with smartphone connectivity.